The great detective Sherlock Holmes and his partner Dr. John Watson are introduced to a younger generation in theses 46 pages. The story is short and a quick read perfect for kids looking for a different kind of graphic novel. 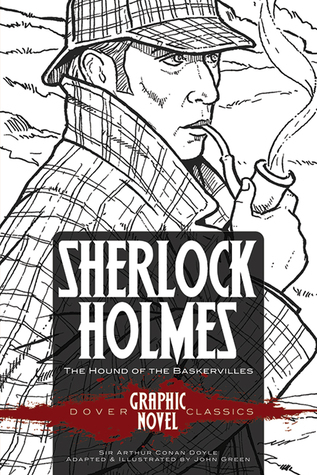 In this adventure Holmes and Watson investigate a mysterious death and a curse. Unlike the Sherlocks we all know and love from TV (Elementary and Sherlock), this Sherlock is not rude and condescending. I did feel the story was a bit rushed and over explained every pane, but I also understand that the target audience is in a much younger demographic than me (wow, that in no way made me sound old), so I definitely say get for your kids, they'll eventually want to read Sir Arthur Conan Doyle's book.